I grew up reading my way through the stacks of books in the children’s area at my local library. I was one of those kids who loved to rearrange the books on her bookshelf (alphabetically, by size, by author … you get the gist). As a new mom, I started gathering all my old books and scouring rummage sales for my childhood favorites. I couldn’t wait until my daughter was old enough for us to read the Little House series and The Chronicles of Narnia together. So, imagine the irony when my daughter reached school age and I realized she was — wait for it — a reluctant reader. Make no mistake — the girl loves being read to, but getting her to read anything independently took an enormous amount of effort on everyone’s part. I tried every strategy I had in my playbook to get her to love reading, but nothing was working — until the day Elephant & Piggie laughed their way into our lives. During a conversation with a local librarian, I mentioned my first-grader’s aversion to reading. “Have you seen the Elephant & Piggie series from Mo Willems?” she asked. I hadn’t. Knuffle Bunny was a family favorite, but we weren’t yet familiar with Elephant & Piggie. When she showed me the series and I had a chance to flip through some of the lively stories, I knew my daughter would love the characters. I’ll give it a try, I thought, and left with several Elephant & Piggie books. “Of course!” I said, holding my breath. As we turned the pages, she really got into her character, reading with a level of fluency and expression that I had never heard from her before. To my surprise, there were no complaints, no whining and no reluctance, just giggles and smiles. But the real surprise came after I tucked her into bed that night. At the 10-minute check-in, I found her huddled under the covers with a flashlight and an Elephant & Piggie book. Reading! On her own! This was the first time she had ever deliberately picked up a book to read independently. This experience reinforced for me the formidable effects that librarians have on children’s lives, as well as the power of finding the right book to interest and motivate a reluctant reader. 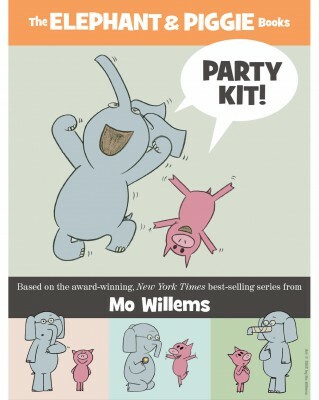 Through simple text and adorable humor, Mo Willems’ books are able to capture children’s imaginations. You can use this interest to extend their learning through games and activities. Check out the fabulous activity guides from Hyperion Books for Children and Upstart below, and try the following Elephant & Piggie activities in your library or classroom to get kids hooked on reading! 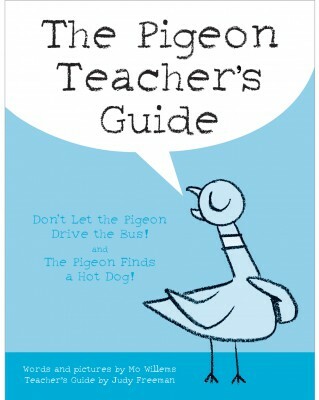 You’ll find a wealth of educational resources in The Pigeon Teacher’s Guide created by Hyperion Books for Children. The guide walks through introducing children to The Pigeon books, interacting with them, discussing the text and themes, and then practicing different forms of writing, including persuasive writing and personal narratives, as well as writing and illustrating sequels to the book. But the learning (and the fun) doesn’t stop there! There are also activities for practicing predicting outcomes and comparing and contrasting, as well as resources for coloring and learning to draw The Pigeon. At the end of your unit or program you can reward learners with an Official Certificate of Excellence in Not Letting The Pigeon Drive the Bus. Have you ever wanted to throw a party with cookies to celebrate The Pigeon and The Duckling? You have? Well, you’re in luck! 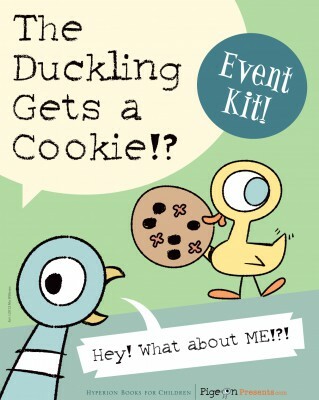 The Duckling Gets a Cookie Event Kit from Hyperion Books includes everything you need to plan and execute the perfect party for young learners. It includes cookie decor ideas, songs and games, and a plethora of learning opportunities, including discussion topics and reproducibles, such as the Manners Matching Game and a Find the Cookie Maze. In this fun guide, Library Media Specialist Matthew Winner shows you how to set the scene for the new school year with Willems’ characters, complete with a Don’t Let the Teachers Drive the Bus display, a cookie toss game and The Pigeon’s wish list. You’ll find games and crafts, as well as writing, math, science and social studies activities, packed into this guide. 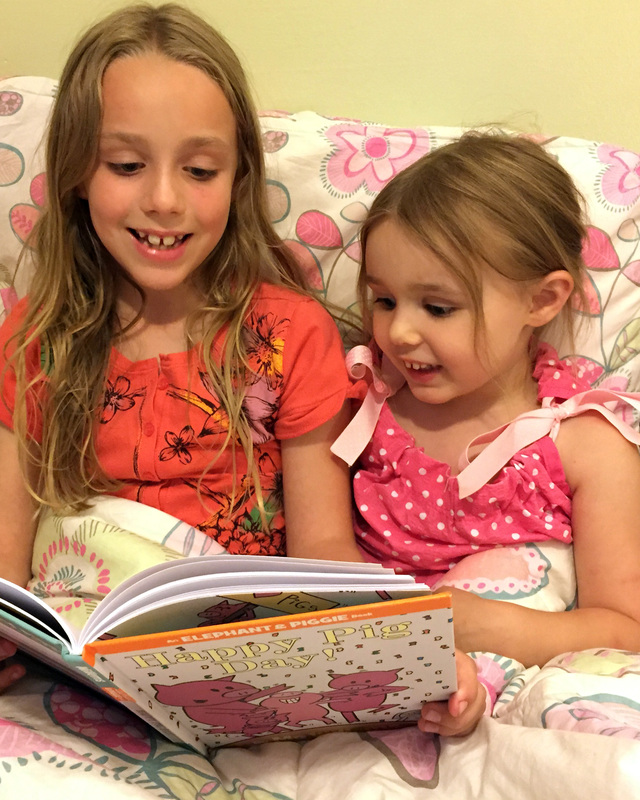 Elephant & Piggie books teach lessons about friendship, emotions, making good choices and more through charming dialogue and expressions of emotion. Using the books as a group read aloud or a play can promote social skills and discussion. The Elephant & Piggie Party Kit offers discussion questions for each book on pages 4–7. Use the questions to spark a dialogue after each performance the groups put on. 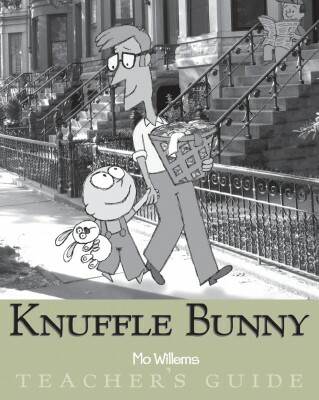 Hyperion’s Knuffle Bunny Teacher’s Guide gives readers a close look at this favorite book, from pre-reading activities to examining the illustrations, characters and plot. The guide offers young learners a wealth of opportunities to use their higher-ordering thinking skills by establishing personal connections, inferring, drawing conclusions and making predictions. The Elephant & Piggie books are great for increasing fluency. The text is simple and accessible and students can reenact the dialogue. Choose multiple titles, pair students (make groups of three or four for titles that have additional characters), assign roles and have students practice reading their lines with fluency and expression. Then, have student groups perform part or all of their books for the class. Tip: You may wish to choose the titles listed in the Elephant & Piggie Party Kit so that you have discussion questions available for each. Feel like partying pig-style? 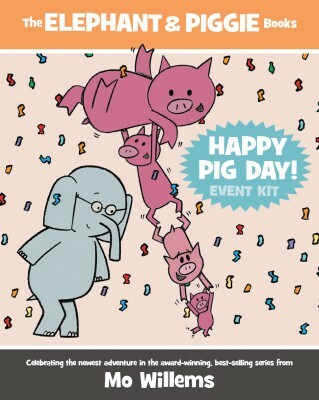 The Happy Pig Day Event Kit is filled with ideas for celebrating everything Piggie, including nametags, invitations, party ideas and lots of reproducible activity sheets. Not only can you learn how to draw Piggie on this site, you can find ideas for people in your life you should thank, including teachers, booksellers and … bananas? 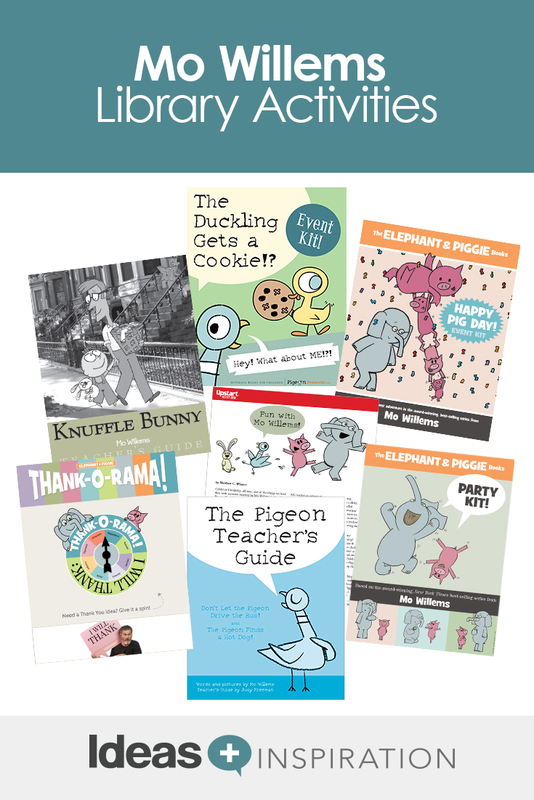 You’ll also find a plentitude of resources at Hyperion’s Pigeon Presents website, as well as Mo Willems’ site. 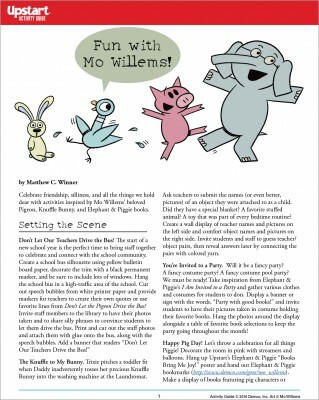 And don’t miss this collaborative library/art lesson from Library Journal Mover and Shaker Andy Plemmons: How to Use Mo Willems Books to Inspire Student Projects. How are you using Mo Willems’ books in your library? Do you have a favorite activity or program that you’d like to share? Tell us in the comments below or on Twitter — we’d love to hear about the great things you’re doing in your library or classroom!